Over the past 25 years, Nu-Track Ltd. has forged a stellar reputation as a market-leading designer and manufacturer of a range of specialist passenger vehicles including wheelchair-accessible coachbuilt buses, minibus conversions, school buses and courtesy coaches. We caught up with one of the former founders, Robert McMullan, at their Antrim HQ to find out more about this exceptional operation. Shortlisted in the Excellence in Innovation Category for the 2016 Belfast Telegraph Northern Ireland Business Awards in association with British Airways, Nu-Track Ltd. provides custom-built, bespoke, wheelchair-accessible vehicles using high-quality materials tailored to the exact specification and budgetary requirements of each individual customer. Currently employing approximately 80 people, its vehicles are in service with the Education Authorities and Health Trusts in Northern Ireland, as well as a number of local authorities in Scotland and England. Key recent innovations include the City Lift accessible bus, based on a VW Crafter CR50 chassis with up to 22 seats or six wheelchairs; City Dash, based on a Fiat Ducato / Peugeot Boxer cab on an AL-KO chassis with the ability to facilitate up to 16 passengers or up to six wheelchairs; and the recently-launched, low-floor-entry 33-seat Nu-Vibe, which has been developed to provide a modern and safe vehicle for the specific requirements of today’s local authority, education, welfare and social transport operators. Meanwhile, the new Euro 6 Nu-Track Pulse has been designed with the support of the base chassis manufacturer MAN to ensure that the best available product was launched into the market place to fulfil the needs of those operating the vehicle on a daily basis. The all new Nu-Track Pulse is built on the MAN TGL 10 tonne platform, with an expected capacity for up to 40 seats depending on wheelbase. The initial vehicle launched will have a seating capacity of 35 seats but it can easily accommodate up to ten wheelchairs in its accessibility format. The final product of Nu-Track’s recent innovations is the Stellar, this is based on the new Iveco Euro 6 and with great anticipation it will be launched in 2016 (Contact the sales team @ Nu-Track for further details). 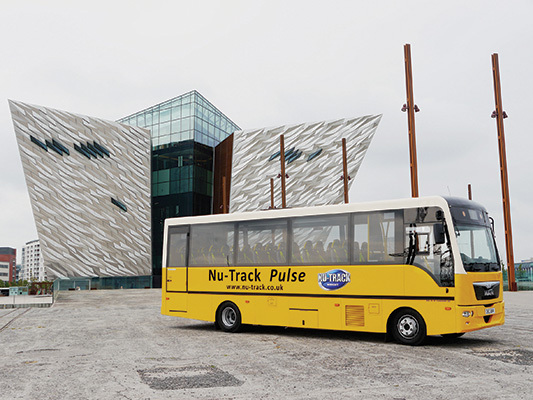 Nu-Track also designs and manufactures a full range of school buses, mobile libraries, minibuses and courtesy coaches for customers all over Northern Ireland and the UK mainland. All vehicles feature lightweight construction, excellent fuel efficiency, bonded glazing, enhanced structural strength and detachable panels for ease of maintenance. Nu-Track takes great pride in dealing with customers on a one-to-one basis, from initial enquiry stage through to delivering a completed vehicle to precise specifications, with a prompt and professional aftersales service ensuring a large volume of repeat business. “Nu-Track Ltd. was formed by myself and five others in 1991,” notes sales manager Robert McMullen, reflecting on the genesis of the company. “We started as a small coach-building firm and quickly turned our attention to niche markets like welfare vehicles, school buses, mobile libraries and wheelchair-accessible buses. “We’ve never done service vehicles. 95% of the buses, coaches and minibuses we build are wheelchair-accessible. That’s the market we focus on. All vehicles are manufactured to the highest possible standards in accordance with precise customer requirements, with a wide choice of chassis available: “In the minibus range, we can build on anything from a Renault or Vauxhall to the Volkswagen Crafter, Mercedes Sprinter and Iveco range,” Robert confirms. Elaborating further on the versatile and flexible product range, Robert comments: “Up from the Iveco, the Mercedes Vario was a great workhorse for authorities and we have worked closely with MAN to develop vehicles to fill that gap for 30 to 43seats. All designs are carried out in-house and every vehicle is built in Antrim, under one roof. Nu-Track’s staff are of the highest possible calibre. “Many of them have been here for a long time. Our builders are fully trained coach builders with full understanding of the skills standard required in this specialised sector of coach building,” Robert adds. Looking to the future, there will be no let-up in Nu-Track’s pursuit of growth through excellence: “We won’t rest on our laurels,” he concludes. “With many of these new products only launched inside the last twelve months, we will keep moving forward. There are always future plans regarding the development and availability of new vehicles. Twenty-five years since its inception, Nu-Track is only getting warmed up!